The development of a Company has many of the characteristics as the development of a person. The necessities to raise an infant are significantly different from raising a teenager or assisting a young adult. Success in Mid-Sized Companies has a proven barrier that will limit the opportunity of achieving the "Next Level". At a set point the infrastructure, staff, systems, and most importantly management cannot optimize the marginal revenue generated. Generally, after achieving a set revenue threshold, the challenges are not directly correlated to the product or services, but the Administrative Capacity Points (“ACP”). These ACP are as real as the physical capacity thresholds. The key difference, between the ACP and the physical capacity threshold point(s), is that the ACP is not easily recognizable or measurable. However, at some critical point, the projected marginal cash from each transaction is no longer being generated. And in many cases, this is associated with the ACP. This happens to every single business entity. Why? Taking longer than expected to get things completed. Margins are inconsistent – the Company prefers to believe it is market, vendors, quality, seasonality, "product mix". . Same Senior Management in place for + 5 years. Same product offering and same top five customers for more than 2 years. The day is absorbed on tactical “fire fighting” not strategic opportunities. No formal advisory board or Board of Directors. The management is in a “comfort zone”. Obviously, there is no set revenue or ratios that yield the ACPs. On average, the ACP thresholds for manufacturing Companies are as stated in the following table. 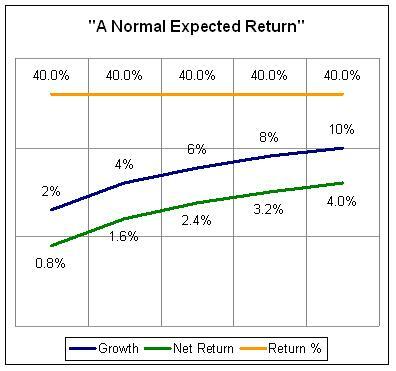 In a “Normal Expected Return” situation, the amount of marginal transactional costs is proportionally absorbed by revenue, efficiencies, optimal financing, and processes. In other words, a second transaction is cheaper on average than the first transaction. You have economies of scale, learning process, efficiencies, processes in place and knowledge of the results. The following table illustrates the different requirements for Companies at various ACP barriers / levels. For illustrative purposes, let us assume that for each 10% increase in revenue or 10% reduction in costs, we expect to have a net return of 4%. This scenario is reflected in the following graph. At the ACP point(s), the organization can no longer absorb the number of transactions, or the complexity associated with the growth of the company. The “fixed costs” are no longer fixed – in a short term. The following chart illustrates a typical scenario. Unfortunately, the negative ramifications of the ACP are usually not apparent. This is especially true when a small to mid-sided company is in a high growth mode. The Company hits this transparent barrier like a “brick wall”. Despite expanding the revenue our growth or reducing cost, the Company is not been able to have these improvement reflected proportionally reflected on the “bottom line”. And yet, the Company is often convinced that with more transactions (revenue) the situation will improve. Whereas, in this scenario, more transactions (revenue) will jeopardize the overall gross margins / performance of the Company. Number #1 problem is that senior management resists the change. The change in culture and change in processes is not always accepted. After all, the present management created and institutionalized the present set of processes and teams. And in their defense - it is their processes and management abilities that have allowed the Company to achieve this prior success - so why change? Albeit the growth is anticipated and expected – the additional support is not strategic or proactive. Support the next level of business (greater than ACP) requires outside financing capitalist, banks, new partners, and creative equity / debt structures. In some cases, different ownership with different objectives. The bank and investors definitely have a different goal than the owner of this business. Change in corporate culture. Just because a culture or set of processes are GREAT for an $8,000,000 company, this culture and / or processes more than likely will not work efficiently for a $24,000,000 entity. Most small businesses try to use the same team that was able to accommodate a handful of transaction to the next level – the skills are different. You reach a point where professional executives are required.